This week for your gustatory pleasure we have a bevy of treats guaranteed to make your heart go pitter pat, whether you to cook, or to eat, or both! Shawn of Everything and Nothing ensures we won't go into chocolate withdrawal with her recipe for Chocolate Syrup Cake. This sounds absolutely decadent. Anne-Marie gives us the ultimate in chocolate desserts: Valentine's Day - Julia Child's chocolate mousse. Anne-Marie suggests adding some coffee or vanilla-flavored liquor. Sounds like a MUST to me! Kathy of startcooking.com offers up a recipe (with plenty of pictures and destructions) for Home-Made Chocolate Fudge. Heh, is there any other kind? And be sure to check out my offering, a story of what went wrong, or the heart tart that never was: Ganache with Panache. Marsha of A Weight Lifted presents 10 Minute Fresh Berry Dessert with Yogurt & Chocolate, shown in the picture here, giving us all a way to indulge without compromising our healthy living lifestyle. Next is a special dessert recipe from KeeWee's Corner for Pavlova. I've never tried meringue and this recipe makes me wanna try. The photo sure looks delish. Here are some fun sweets, for when your sweeties are kids, or just the kid in your sweetie. More4kids presents Valentine Recipe Ideas - Heart Cookies, Valentine Pancakes and more. I love the pancakes! For Valentine's Day breakfast, this recipe from Maureen at Trinity Prep School for Raspberry-Cinnamon French Toast Bake sounds LOVERLY ! It's not your average french toast nor is it your plain egg bake. Riannan from In the Headlights offers us a tasty dish: Grouper, Shrimp and Artichokes in Tarragon Cream. This recipe could serve 6, she says, but I bet you and your sweetie could feast, and then have leftovers at 1am. Broke and busted? Make your Valentine's evening special, no matter your budget, by making spaghetti with love, and Cheap Homemadish Spaghetti Sauce from triticale, the wheat/rye guy. Something to replenish body and soul, and that of your loved one, is Seriously Good Kevin's recipe for Pastitsio, a Greek meat and pasta pie Kevin refers to as "peasant food". Whatever it is, it sure sounds good. DeputyHeadmistress at The Common Room has posted a great recipe for "tangy-sweet salad": Honey-Orange Bean Vegetable Slaw with good explanations and commentary. I love it when folx explain how they used or modified a recipe and why. For one-dot cooks like me, this is so helpful! Erika over at Tradition offers three recipes in Cold Weather Recipes: Mulligatawny Soup, The World's Best Ever Biscuits, and last but not least, Fudgy Brownie Pudding. Sounds like a warm meal from the heart! You could really WOW your sweetheart with this recipe for Succulent Lamb Kebabs from Daryl at Authentic Malaysian Cuisine & Food Recipes. Wonderfully exotic, and yet, so easy! Jennifer Miner of Travel Articles says this is The World's Best Artichoke Dip: A great recipe for artichoke dip that'll be the hit of the party. This is a hot dip that Jennifer spruces up by sometimes adding crab, red peppers, and eggplant. Now here's an idea from Andrea of Wisebread Frugal: Tortillas and Chilaquiles: Romance him with sports bar food?. If you met your hunny in a sports bar, what better way to celebrate the occasion! 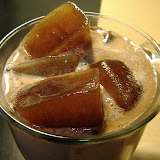 The Hermit of The Ziggurat of Doom is whipping up some very special iced coffee. This is a MUST for after dinner, with a warm desert. I'm so THERE. That's all for me on this one folx! I hope you all have a delicious and love-ly Valentine's Day! Next week's Carnival will be hosted at Techno Gypsy. Submit your recipes via email to recipedotcarnivalatgmail.com, or use the Blog Carnival submit form. Fantastic website! I must say i appreciate the best way it is very in our little brown eyes and also the information is definitely well written. I ll prefer buttery brioche cake with a caramel cream, named Bee Sting because it is glazed with honey just before baking. 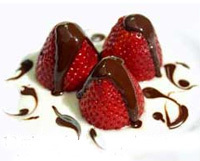 Yummy... the strawberries with chocolates are mouthwatering, a perfect gift for a love one, match it with some flowers, ...gorgeous. 'So glad for the links you provide here, thanks a lot. I think it is a really powerful piece of information. I am used to reading articles on the websites. I am so influenced by your way of expression and writing. Looks like I can try my hand on it. valentine day just wanted some really romantic ideas to celeberate that. Nice effort, very informative. Thanks for sharing these. I would like to use your idea in coming valentines day thanks a lot for sharing this post. 1)	The order was delivered at 10 pm in the night. Do they even know that 3 year old kids go to bed by 10 pm? 2)	The order was for Black Forest cake. Instead they delivered pineapple cake. My niece is little picky about what cake to eat. She didn’t even taste that horrible cake. When the order was Black forest cake, why should the deliver pineapple cake? 3)	The order said 12 roses. Instead they delivered some weird looking things which can be called as flowers in biology but in layman’s term, they are referred as garbage. I specifically chose roses because my niece is fond of roses. They don’t understand the difference between roses and garbage. 4)	The delivery person was very arrogant with the host. Sane people stay away from AmchieMumbai.com. I was insane, now I am different. Ziggurats were built by the Sumerians, Babylonians, and Assyrians for local religions. Each ziggurat was part of a temple complex which included other buildings. The precursors of the ziggurat were raised platforms that date from the Ubaid period during the fourth millennium BC. The earliest ziggurats began near the end of the Early Dynastic Period. The latest Mesopotamian ziggurats date from the 6th century BC. Built in receding tiers upon a rectangular, oval, or square platform, the ziggurat was a pyramidal structure with a flat top. Sun-baked bricks made up the core of the ziggurat with facings of fired bricks on the outside. I enjoyed reading your post. It makes a lot of sense. I will try to make something like that this weekend. Thanks for guiding me through this. Rarely do I find good entries that would walk me through. Gifts2India.in is an online gifting service provider for the Indian community residing outside of India and whose friends and family is in India. Gifts2India.in offers a wide range of gifts & shopping items that would make your loved ones happy on each important and special occasion. Thanks for guiding me through this. Rarely do I find good entries that would walk me through. Great post. I agree this so absolutely great site.Will certainly visit your site more often now. http://www.giftstoindia.com helps you to order online to Gifts to India gift experts hand-pick the best gifts from the best stores on the Web. Find Valentines gift ideas and unique gifts for men, women, teens, children and baby. See our top Valentines roses to send, search birthday gifts, find a wedding registry and more. Articles and content in this section of the website are really amazing.. Send fresh cakes, flowers, gifts to Bangalore online on Birthdays, anniversaries and weddings of your near and dear ones. liliesnroses.com offers wide range of flowers, floral gifts, teddy bears, cakes, chocolates, sweets, dry fruits delivery to all over Bangalore (India) at low and affordable price.